Italy, the fair’s partner country, produced the biggest stand. However, the fair stall was not the country’s only offer. Visitors could taste Italian specialties, try the best coffee and meet eminent Italians. The Emilia-Romagna region’s press conference featured outstanding sportspeople who serve as ambassadors of active tourism. Alberto Tomba invited guests to try skiing, while Davide Cassani – bike trips. Italian Ambassador Aldo Amati was right in saying: “Discover Italy, where everyone will find something for themselves.” Numerous attractions encouraged the public to visit the stands prepared by Egypt, Tunisia and Turkey, which have been regaining popularity among Polish tourists. Greece, Bulgaria and Croatia, as well as the increasingly popular Morocco, Albania and Georgia were not lagging behind. There were plenty of people who wanted to learn Greek and Georgian dances. The exotic presentations by Sri Lanka, Thailand and Madagascar or the Dominican Republic lured the public with extraordinary colours, while Moldova, Slovakia and Romania tempted visitors with glasses of excellent wines. Palestine offered a competition in which the main prize was a flight and a several-day stay for two people, but there were also competitions on other stalls. The exhibitors stressed the good location of the Palace and its uniqueness. Alessandro Gentini, who represented the Island of Elba, was probably the best in summarising it: “It is an excellent location in the very heart of the city and at the same time so different for other fair exhibitions, and thus very memorable. I have visited many fair events around the world, but I believe this place is the most beautiful. However, Poland was not at all outshined by the less and more exotic competitors. The Polish Tourism Organisation’s stand lured the public with numerous competitions, while the Local Tourism Organisation from Toruń taught people how to bake gingerbread. Mazovia showed that one can find numerous attractions near Warsaw and the Lubelskie province invited visitors to try regional specialties. The “Relax in the Country” presentation, which was pleasing to the eye, encouraged people to try agrotourism. “We are here as part of an initiative organised together with the Ministry of Agriculture and Rural Development,”said Wiesław Czerniec, chairman of the board of the Polish Rural Tourism Federation “Hospitable Farms”. “It is our last fair event this year and one that I believe to be the best,” he added. However, Lesser Poland outshined all the Polish stalls this year. The red beads that it handed out were an effective method of advertisement, with women wearing them around at least half of the fair stalls. Lesser Poland attracted the public with regional wines that are a good match for the ones that foreign stalls offered. The Polish stall was impressive not only in terms of quantity but first of all due to the quality of the presented publications and its hospitality. “The most important thing is to make our visitors smile. Tourism should bring joy, it can’t be treated with solemnity and seriousness,” said Karolina Jawor, event marketing specialist for the Lesser Poland’s Tourism Organisation. The subjects of this year’s conferences and debates were extremely varied. However, all the events had common features, including topicality, selection of panellists and very high quality standards. This has been confirmed by the strong interest of the industry and the media. The fair’s highlights included a debate on outbound tourism prepared by the turystyka.rp.pl website, which attracted the CEOs of Poland’s leading tour operators, and a debate on the reform of the tourism law related to short-term rentals, arranged by the Ministry of Sport and Tourism, which attracted numerous representatives of local governments as well as regional and local tourism organisations and entrepreneurs. “It is a difficult subject that demands discussion and this is a great place to hold such a discussion,” said Iwona Majewska of the Mazovian Regional Tourism Organisation. High quality professional conferences organised by ECTAA, the Polish Tourism Organisation, the Polish Chamber of Tourism and the WaszaTurystyka.pl website are also worth mentioning. All presentations by travellers were packed, but a meeting with Janek Mela attracted the most people. Mela is a living proof of the triumph of passion and engagement over human weakness. Mela admitted: “What pleases me most is to receive messages that my story and activities have inspired others to take up similar challenges.” Bloggers Natalia Sitarska and Łukasz Smoliński, also known as Tasteaway, answered numerous questions related to travelling with young children and were effective in encouraging people to overcome their concerns, because the world is wide-open and there is no point wasting time. The packed rooms during these and other meetings – devoted to Croatia, Iceland, Turkey, the Czech Republic, Armenia, Georgia, Iran and Morocco – clearly show that there are plenty of people who are interested in meeting travellers. The Cristal Globe – the Polish Tourism Fair Play award went to Nadwiślańska Agencja Turystyczna. The Homo Turisticus award for the most professional stand was granted to Italy. Israel took the second place in this competition and was followed by Lesser Poland. Logos Travel Marek Śliwka and Moldova won the new AcTTive competition that promotes active tourism, while the Czech Republic and Mazovia earned the distinctions. It is a well-targeted competition that responds to global trends. The tour guides that I employ now have to be runners as well,” said Marek Śliwka, who himself is a marathon runner, while Ivana Bilkova who represented the Czech Republic, added: “We must promote sports and physical culture. We show that the Czech Republic means not only skiing, but also cycling, water sports and trekking.” This year the Grand Prix for the general cooperation was collected by Dr Robert Andrzejczyk, CEO of the Polish Tourism Organisation, and Giovanni Bastianelli, General Director of the Italian National Agency for Tourism (ENIT). It should also be mentioned that MT Targi Polska CEO Urszula Potęga received a silver cross of merit for her achievements from Minister of Sport and Tourism Witold Bańka. 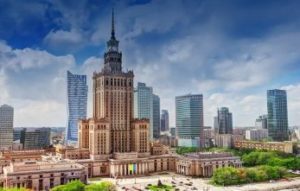 The 27th International Tourism Fair TT Warsaw will be held on 21-23 November 2019 in the Palace of Culture and Science in Warsaw. Make sure to put it in your calendar today!